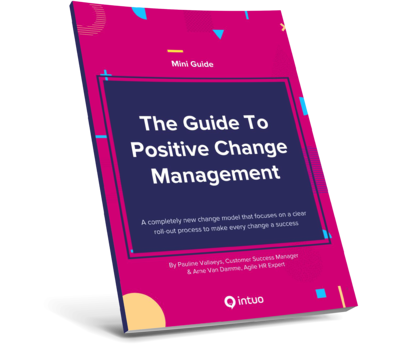 Keep the resistance for change as low as possible with intuo's positive change management model. 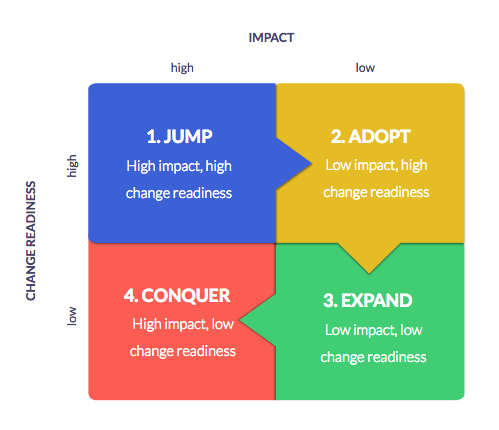 Use the dedicated change management action grid to reach your change goal. How you positively communicate the change to every group in your organisation.
" In order to be ready for change, you need to focus on your roll-out approach...It's crucial that at first, you ignore the sceptical people and try to build a very positive group of change-minded people. The latter will grow over time and after a while, the negative people will feel excluded and will either participate or leave." 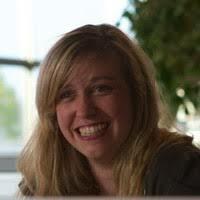 Starting a new change project? Changing a culture or installing new habits is a difficult process with many ups, downs, successes and setbacks. This mini guide helps you identify the right people, focus your efforts and successfully implement cultural changes across the entire company. The roadmap helps you to set your course towards a clear goal. Definitely a must read! Because as most of us know, a good implementation plan is already half of the battle.